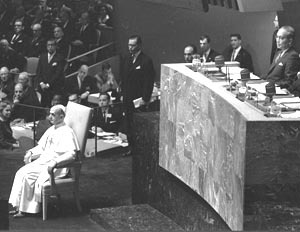 A little further, Koch expanded that malefic influence beyond those German-speaking countries to include Italy in the area under Küng’s hex: “I believe our countries received Vatican Council II in a very particular way, above all by embracing the interpretation given by Hans Küng and, then, by much of the mass media” (The Tablet, May 5, 2012, p. 28). Card. Koch as a sycophant minion is merely following the lead of the Pope. Indeed, the last years we have seen Benedict XVI intensely promoting the “hermeneutics of continuity,” trying to present the Council as a harmonic development of the previous Magisterium. This is not, therefore, a new maneuver, but Card. Koch’s interview is the first time that a high Vatican representative has singled out just one theologian as responsible for presenting Vatican II as a rupture. 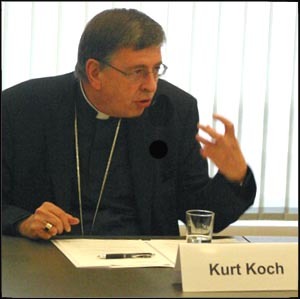 For Kurt Koch, the scapegoat for the entire “conciliar revolution” supposedly is Fr. Hans Küng. This “official choice” of a single scapegoat for this revolution shocked me as a rare expression of hypocrisy. The Vatican officials know perfectly - as does Benedict XVI - that this is not true. There is not just one single theologian to blame for either the Council or its fruits. The Council was the product of more than 100 years of an unremitting onslaught of a current of thinkers, who belonged successively to Catholic Liberalism, Modernism and Progressivism, carried out against the Catholic Church as Militant, Monarchic and Sacral. In its turn, the fruits of Vatican II have been uninterrupted fostered by the five Conciliar Popes and by the ensemble of the Catholic Hierarchy for more than 40 years. Most of the progressivist theologians strongly concurred as well to produce the result of what is now called the hermeneutics of rupture. 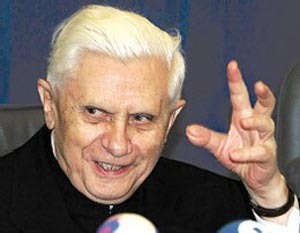 Therefore, it is bogus to see Pope Ratzinger changing the reality to make the Council more palatable to Catholic public opinion, which in the last decades has become increasingly conservative in some regards. And it is a rare example of hypocrisy to see Cardinals of the Holy See trying to pick a single scapegoat to save themselves and their dear Conciliar Popes from the obvious blame they share for the wholesale rejection of the Catholic past. I believe I can easily substantiate my assertion by presenting a few samples of how those Popes, Prelates and theologians have favored this hermeneutics of rupture. Collaterally, these texts may serve as weapons to defend my reader to not be fooled by this new wave of false conservatism, which could better be called a mitigated Progressivism. Undoubtedly, many things have changed since then. The new ecclesiastical policy of Pius XI established some openness toward the liberal conception of the State. In a silent but persevering combat, Exegesis and Church History increasingly adopted the postulates of liberal science; on the other hand, in face of the great political upheavals of the 20th century, Liberalism was obliged to accept notable corrections. Let us content ourselves here with stating that the text [of Gaudium et spes] plays the role of a counter-Syllabus to the measure that it represents an attempt to officially reconcile the Church with the world as it had become after 1789. On one hand, this visualization alone clarifies the ghetto complex that we mentioned before. On the other hand, it permits us to understand the meaning of this new relationship between the Church and the Modern World. The duty is, therefore, not to suppress the Council, but to discover the real Council and delve deep into what it truly wants with regard to what has happened since then. Question - What problems will be oriented differently by the Council, Your Eminence? Wojtyla's Answer - Above all, it will serve to give more value to the authority of each Bishop and to promote decentralization inside the Church, as well as to return to the principle of collegiality, re-evaluate pastoral methods in force until now, and effectively introduce new methods and ways - at times most audacious ones. There is also the question of the universal character of the Church; there is a change of attitude toward the ancient cultures of the non-European peoples. It is necessary to de-Westernize Christianity. The peoples possessing their own ancient cultures have understandable psychological barriers against Christianity when it presents itself in its European trappings! The Africanization, Indianization, Japanization, etc. of Catholicism reveals itself as necessary. This consists of making Christian substances germinate in their cultures. We know that all this is neither simple nor easy to accomplish. In the life of the Church and, consequently in the life of each of her children, we will thus have a period of greater liberty, that is to say, of fewer legal obligations and less internal prohibitions. Here are just a few samples showing that the rupture with the Militant Church of the past cannot be attributed to some few radicals of the ilk of Fr. Hans Kung. This is a blatant inaccuracy, so blatant that I would say that anyone who employs it is either a complete illiterate in Church matters or a consummate hypocrite. 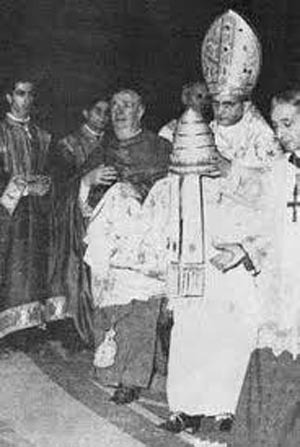 I still have many texts proving that the hermeneutic of rupture is inherent to Vatican II itself, confessed by those who made the Council. I plan to list some of these documents in other articles (here and here) to come. Native Masses in the U.S.